The common tutorials on how to play DOTA 2 especially the latest DOTA 2 Reborn in offline mode still requires internet connection on first step because you need to login your account in Steam client to access the 'Go Offline' mode. And this is hassle for some who are eager to play DOTA without internet. Below is the typical DOTA 2 'Go Offline' Steam method which requires you to login your Steam account then after logging in, you can disconnect your internet and click the 'Go Offline' in the Steam menu. In this post, you will surely play DOTA 2 offline, no internet required and no Steam login required perfect for players with slow internet connection, volume based internet or no internet connection at all. Using RevLoader, you can play DOTA 2 Reborn AI mode and DOTA 2 Reborn custom maps/custom games from Valve including Overthrow, Dota 10v10 and Colosseum, as well as from Community-creations including Roshpit Champions, Angel Arena Reborn, Angel Arena Black Star, Memes Reborn, Spin TD, Guarding Athena, Skillshot Wars, Attack on Hero, Battleships, Crumbling Island Arena, Custom Hero Survival, Dota IMBA, X Hero Siege: Reborn, Epic Boss Fight, Gem TD, Legends of Dota, Legends of Dota: Redux, Life In Arena, Naval Warfare, Pimp My Peon, Warlock Brawl, Legion TD Reborn, Horde Mode, Wraith Night: Expansion, Warchasers, Tree Tag, Survival Co-op, SF Wars, Retro Dota, Reflex, Pudge Wars, Invoker Wars, Dota Strikers, Enfos Team Survival, Adventure Mode, Quadroside, Footmen Frenzy, Capture Points and many more. But wait there's more, you can also use all items including arcanas, immortals, sets, terrains, weather effects, cursors, announcer packs and others. 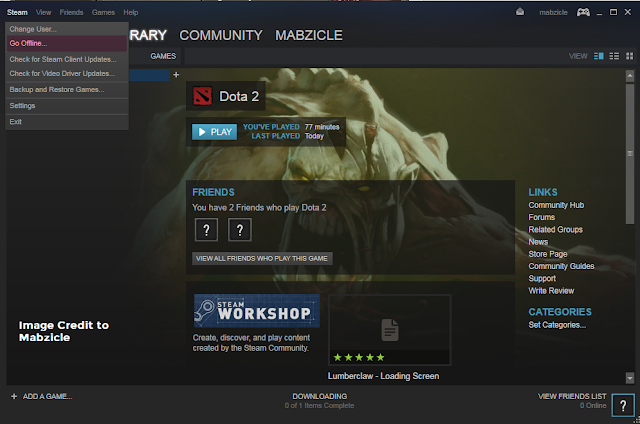 Here's how to play DOTA 2 Reborn offline without logging in to Steam using RevLoader. Before proceeding, make a backup of your DOTA 2 and disable your antivirus too. GCFscape Runtimes: Skip this if you already have them installed on your computer. Install DOTA 2 Reborn v7, update the latest patch and download Custom Maps also. If you have slow internet connection, you can ask for a copy to your friend with dota 2. You need a flash drive or an external drive with atleast 32GB of data capacity, NTFS format. Right click DOTA 2 icon on the desktop > select "Open File Location" > on the address kafe above, click the previous folder > then copy now the folder commonly named as Steam. DOTA 2 Reborn has approximately 14-16GB of total size. If the size is over 14-16GB, you can safely delete the DOTA 2 Reborn replays first which can usually found in "...Steam\SteamApps\common\dota 2 beta\game\dota\replays\". 2. Open dota2 reborn plus launcher.exe, extract the files to your DOTA 2 Steam directory "...Steam\SteamApps\common\dota 2 beta\game\bin\win32"
- steamclient.dll to "...Steam\SteamApps\common\dota 2 beta\game\bin\win32"
- tickets_570.bin, items_570.bin, avatar1.dat, avatar.dat to "...Steam\SteamApps\common\dota 2 beta\game\bin\win32\platform"
4. Next, copy the updated steam.inf located at "...Steam\SteamApps\common\dota 2 beta\game\dota" and paste it to "...Steam\SteamApps\common\dota 2 beta\game\bin\win32\dota"
5. Done! 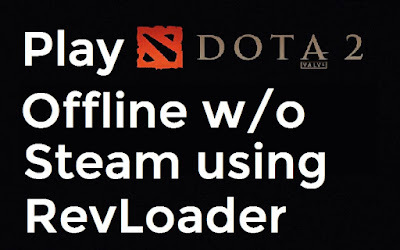 Run the Launcher or RevLoader and you are now able to play DOTA 2 offline directly without the need to login to Steam. For Solo Gamers, just create a Practice Match with AI bots, select solo and the difficulty of the bots. Update your Steam first using internet then copy the updated "steam.inf"
Open console by pressing the backslash key "\" (without the double quotes), in the game lobby. dota_bot_populate (to fill the empty slot with bot/AI) Skip this if you will play with another player. - Go to your Dota 2 installation directory where revloader rev.ini located. "...Steam\SteamApps\common\dota 2 beta\game\bin\win32"
- Edit the REV.INI using Notepad. Before proceeding, you must have downloaded DOTA 2 Reborn Custom Maps first. 1. Locate custom maps directory in "Steam\SteamApps\workshop\content\570". Use 'search' in the top right of the window then type "publish_data" (without the quotes), it will show you many results of publish_data.txt, open one of it and you will see the name of the custom map, right click your chosen publish_data.txt and click 'Open File Location'. For example : I have opened publish_data.txt that contains 'Overthrow' then 'Open File Location' I found 455312245.vpk. And that vpk is what we need to extract using GCFScape. 2. Go to "Steam\SteamApps\common\dota 2 beta\game\dota_addons" then create new Folder. For example : I will create a folder named 'Overthrow' then open GCFScape.exe, select and open 455312245.vpk then extract it to "Steam\SteamApps\common\dota 2 beta\game\dota_addons\Overthrow"
4. Done! Enjoy playing DOTA 2 Reborn Custom Maps or Custom Games in offline mode, absolutely no internet required. 2. Can I use this in public/ranked matchmaking? - You CANNOT use it on legit Dota 2 servers. In the first place, you're unable to join in them. 3. Will this be usable forever? - No, therefore we must wait for an updated version when revLoader doesn't work properly. 4. It always shows "Connecting to the Dota 2 network"
- Right-click revLoader.exe and select "Run as administrator". Alternatively, right-click, select Properties. Under the "Compatibility" tab, check "Run this aktivitas as Administrator", apply and press OK. If you have any comments regarding this tutorial, you can leave them below. Thanks for reading!